These twenty-three crosses are all packed up, and headed across the country to their new home. It took me ages to work out how to quilt this design -- swirly stippling didn't seem to go with the geometric design, but I couldn't bear to sew through the black crosses with white thread. In the end (thanks to a little quilterly advice), I used straight lines, but skipped over each cross. The crosses are then outlined with a line of black thread. Time-consuming and oh-so-much turning, but finished at last. On the back, a gingham-ish black print, broken up with a line of low-volume prints from the front. Such a pleasure to sew with this collection of all time favourite fabrics, and experiment with low-volume prints like this. When I look at the quilt from a distance, new patterns seem to emerge in the background, from where the pure whites or the greyer fabrics fall, or where the little fox heads pop up. And, of course, just a little bit of red. I love how you filled in the background! It's a beautiful quilt! lovely quilt. i love the use of low volume fabrics for the background. a very grahic look with the black crosses. Love this ! Just found you today but by what circuitous route I am uncertain. You will go on my Bloglovin' list. 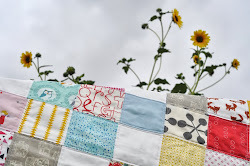 beautiful and modern.. first time i am here on your blog.. this quilt brought me here.. nice one! I adore this. I am so in love with low volume right now. I love the black crosses. Looks amazing. This is gorgeous, do you have any information on the fabric you used? Is there a tutorial for this? Lovely! this is maybe the nicest quilt I've seen. Any chance there's a pattern or a tutorial anywhere?? I recognize a few fabrics (one's ikea!) but I'd love to hear more about the list.. Such a wonderful quilt. 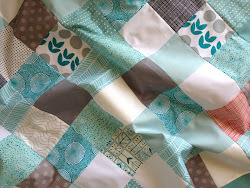 Thanks for sharing the quilting details. I agree with the not wanting to cut through the black crosses with white thread. The extra time spent on the details really make this quilt pop!